Custom built solid wood rectangle step stool. Measures 16" x 10" x 10" high. Painted black, then left solid or edges lightly distressed. Tapered legs, tip resistant. Extremely strong! Will hold 300lb plus. All hidden pocket hole construction. Made to order! Build time is 2 - 3 weeks! From our sawmill to your home! If you love the beauty of nature, let us enhance your home indoors and out. All our works are handcrafted, beginning with a salvaged tree, or reclaimed lumber, to milling, to drying, to handpicking the selected wood for the finished product. 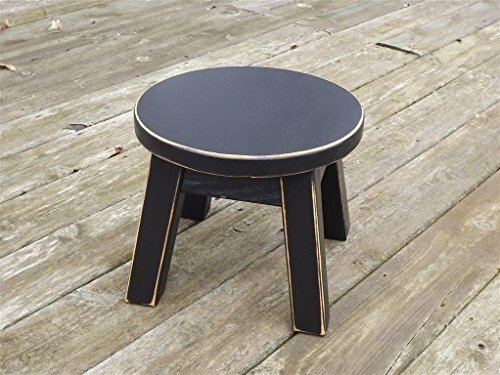 This sturdy stool would be a great addition to any home décor. A great item to help reach those top shelves in the kitchen or to boost a child's reach. 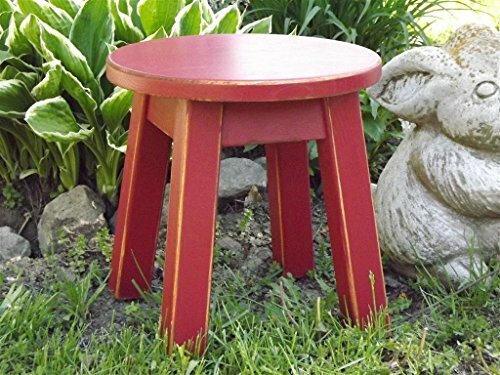 The stool overall size is 12" tall by 13" wide by 10 1/2" in depth. Each step is 3/4" thick pine which is 6" high, 13" wide and 5 1/2" deep. The stool sides and cross members are made of reclaimed 1" thick Fir. All the joints are reinforced with wood screws hidden with the matching wood plugs. The use of reclaimed wood may introduce small holes, tight knots or small surface flaws that are part of the woods unique texture. All the material is inspect and assessed prior to use and sealed with paintable/stainable putty. All the edges are slightly chamfered to avoid sharp edges. The whole stool is sanded glass smooth ready for staining or painting. All the stools are handcrafted one at a time in my workshop. Please E-mail any questions. Custom built solid wood rectangle step stool. Measures 16" x 10" x 10" high. Painted heirloom white, painted solid or edges lightly distressed. Tapered legs, tip resistant. Extremely strong! Will hold 300lb plus. All hidden pocket hole construction. Made to order! Build time is 2 - 3 weeks! From our sawmill to your home! If you love the beauty of nature, let us enhance your home indoors and out. All our works are handcrafted, beginning with a salvaged tree, or reclaimed lumber, to milling, to drying, to handpicking the selected wood for the finished product. 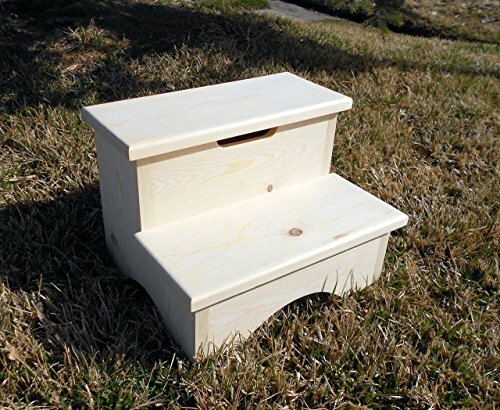 Storage Box Step Stool Unfinshed 12"
This sturdy stool would be a great addition to any home. A great help reach those top or to boost a child's reach. 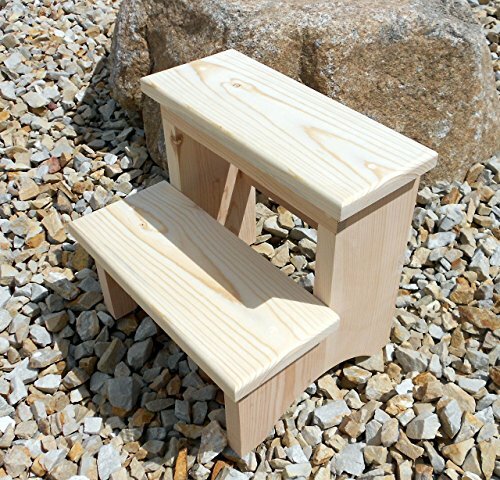 - The stool is made of solid white pine. 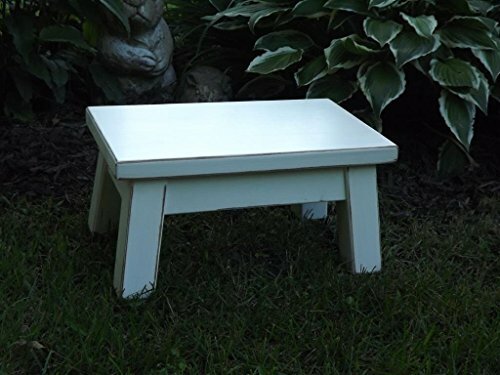 - The stool overall size is 12" tall by 13" wide by 13" in depth. - Each step is 3/4" thick pine which is 6" high, 13" wide and 6 3/4" deep. - All the lap joints are reinforced with wood screws hidden with the matching wood plugs. - Small knots are sealed with paintable/stainable putty. - All the edges are slightly chamfered to avoid sharp edges. - The whole stool is sanded smooth ready for staining or painting. Custom built solid wood round top step stool. Measures 12" diameter top x 8" -10" - 12"high. Painted black, then edges lightly distressed, or left solid paint. Choose at checkout. Tapered legs, tip resistant. Extremely strong! Will hold 300lb plus. All hidden pocket hole construction. Made to order! Build time is 2 - 3 weeks! From our sawmill to your home! If you love the beauty of nature, let us enhance your home indoors and out. All our works are handcrafted, beginning with a salvaged tree, or reclaimed lumber, to milling, to drying, to handpicking the selected wood for the finished product. Custom built solid wood round top step stool. Measures 12" diameter top x 8"-10"-12" high. Painted colonial red, then edges lightly distressed. Tapered legs, tip resistant. Extremely strong! Will hold 300lb plus. All hidden pocket hole construction. Made to order! Build time is 2 - 3 weeks! From our sawmill to your home! If you love the beauty of nature, let us enhance your home indoors and out. All our works are handcrafted, beginning with a salvaged tree, or reclaimed lumber, to milling, to drying, to handpicking the selected wood for the finished product. 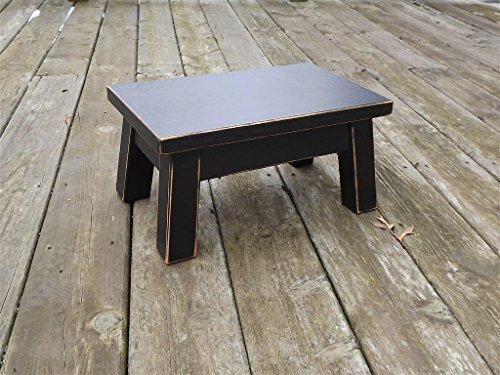 Custom built solid wood rectangle step stool. Measures 16" x 10" x 8" high. Painted your choice of colors, then left solid paint or edges lightly distressed. Tapered legs, tip resistant. Extremely strong! Will hold 300 lb plus. All hidden pocket hole construction. Made to order! Build time is 2 weeks! From our sawmill to your home! If you love the beauty of nature, let us enhance your home indoors and out. All our works are handcrafted, beginning with a salvaged tree, or reclaimed lumber, to milling, to drying, to handpicking the selected wood for the finished product. A Beautiful Handcrafted Pine Stool With Turned Legs and Walnut Stain Top, Heavy Duty To Last Many Years! 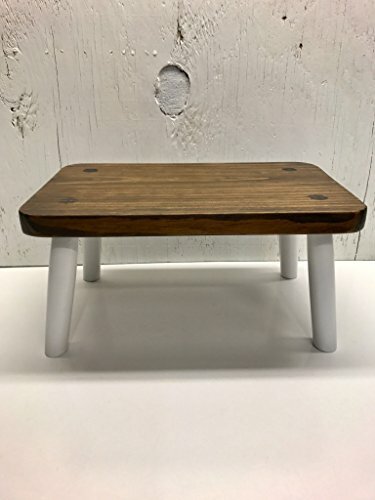 Custom built solid wood rectangle step stool. Measures 16" x 10" x 8" high. Painted heirloom white, then paint left solid or edges lightly distressed. Tapered legs, tip resistant. Extremely strong! Will hold 300lb plus. All hidden pocket hole construction. Made to order! Build time is 2 - 3 weeks! From our sawmill to your home! If you love the beauty of nature, let us enhance your home indoors and out. All our works are handcrafted, beginning with a salvaged tree, or reclaimed lumber, to milling, to drying, to handpicking the selected wood for the finished product. 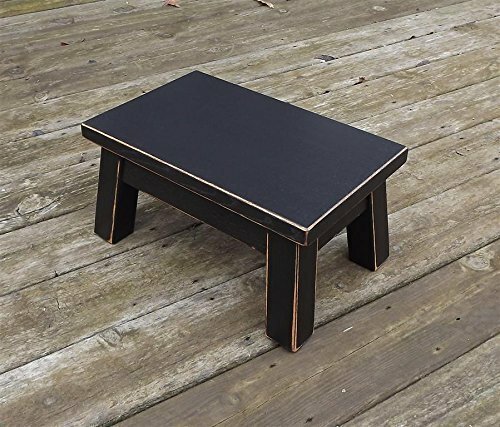 New Shaker Inspired Rustic Alder 3-Step Stool This sturdy stool would be a great addition to any country home or mountain retreat décor. A great item to help reach those top shelves in the kitchen or to boost a child's reach. This unfinished stool is 21" tall, 14 1/2" wide and 14 1/2" deep with each step being 7" high. The complete stool is made from rustic or knotty alder hardwood. The sides and rails are ¾" thick with the lap joints being reinforced with screws hidden by matching plugs. Knotty Alder which has the strength of maple and the personality of pine is a great material for the rustic look since it contains small knots and minor surface flaws that add to the unique rustic look. All the edges are slightly chamfered to avoid sharp edges with the whole stool being sanded smooth ready to be finished. . Please E-mail any questions. 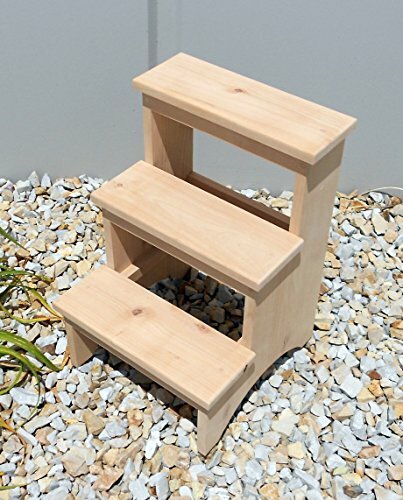 Compare prices on Shaker Step Stool at TopShopion.com – use promo codes and coupons for best offers and deals. We work hard to get you amazing deals and collect all avail hot offers online and represent it in one place for the customers. Now our visitors can leverage benefits of big brands and heavy discounts available for that day and for famous brands.